Pegasus was a friend of the Muses, and his correlation to wine making was his pivotal role in taking flight to the sky to create thunderbolts and storms bringing rains to irrigate the vineyards mentioned in Greek mythology. Pegasus is one of the most highly recognized creatures in Greek mythology. 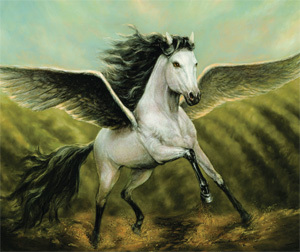 Pegasus is a winged divine horse, usually depicted as white or light in color. He was sired by Poseidon, in his role as horse-god, and foaled by Medusa. Greco-Roman poets write about his ascent to heaven after his birth and his devotion to Zeus, King of the Gods, who instructed him to bring lightning and thunder to Mount Olympus. Pegasus was a friend of the Muses, and his correlation to wine making was his pivotal role in taking flight to the sky to create thunderbolts and storms bringing rains to irrigate the vineyards mentioned in Greek mythology. The symbolism of Pegasus varies with time but has consistently been a symbol of wisdom and especially of fame from the Middle Ages until the Renaissance. Pegasus became a symbol of poetry in which the poets come to draw inspiration, particularly in the 19th century. Pegasus is the subject of a very rich iconography, especially through the ancient Greek pottery including wine vessels and paintings and sculptures of the Renaissance. Personification of the symbolism and his relation to water and solar and irrigation of the vines, his followers have seen in Pegasus a profound symbolic esoteric spiritual energy that allows access to the realm of the Gods on Mount Olympus and the proliferation and continuation of successful wine production for all of the centuries to come! Our wine label was created by the multi-talented and extremely gifted artist Jennifer Chapman. The scene is an amalgamation of the creative genius of Jennifer in a rendering that she crafted of an oil on canvas that symbolized “Dharbe” our prized Arabian horse taking flight as “Pegasus” over our vineyards.